Elite 10G–Augmented Category 6 UTP 24 Port Patch Panels deliver excellent headroom beyond 500MHz. They exceed the TIA/EIA Cat 6A Specification to support BASE-T standards. Patented PCB circuit & unique contact alignment does the main work in suppressing the internal magnetic coupling between pairs. Press-fit technology is applied for full-line production to prevent the potential risk of RoHS compliance. No solder, no lead. Compact figure allows to work with Leading 10G. Leading 10G Cat6A 24 Port Patch Panels lead you to the gateway that expedites 10G over copper solution! 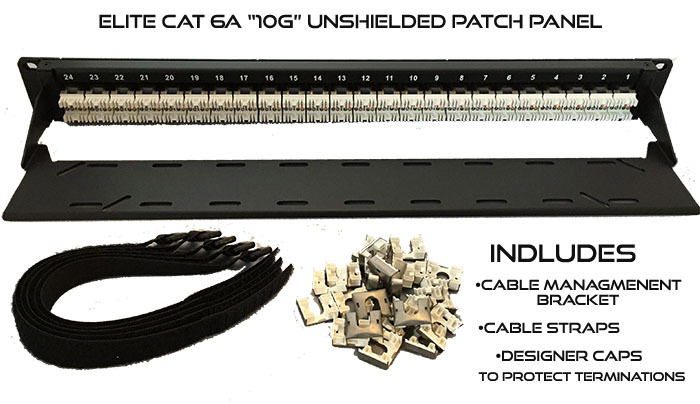 The Patch Panel features easy Install Terminations. The Rear Terminations side of the panels feature cable feed in panels which keep the cables straight at right angle with the panel and keep the cables separated from each other thus eliminating any chance for alien crosstalk at this termination point. These Patch Panels have been extensively tested in the laboratory, and in the field. 10Gb/s performance, meeting or exceeding all performance requirements of the pending Category 6A (augmented category 6) standard, including alien crosstalk.